After defeating the Red Coats and ousting the British in 1781, the colonists were faced with the daunting task of revising their system of government. The original system, the Articles of Confederation, was a failure. The states were too powerful while the federal government was too weak to accomplish anything. In May 1787 each state sent delegates to convene in the Philadelphia statehouse to revise the Articles of Confederation. 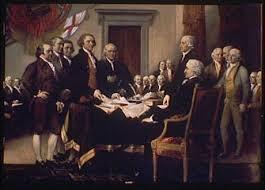 Throughout that summer the meetings, known as the Constitutional Convention, continued. In order to ensure that the meetings proceed unhindered, they were closed to the public. Doing so required guards to be stationed at the doors and the doors and windows to remain shut, making the room stifling hot. The delegates were heavily influenced by the writings of Locke, Montesquieu, and Rousseau, and they strongly debated how to merge those ideas into a practical form of government. On September 17, 1787 the delegates completed their task. They had not revised the Articles, but had drafted a new governing body known as the Constitution of the United States. Ramban explains that the Book of Shemos is dedicated to relating how we were able to achieve closeness with G-d on a national level. The final verse of the Chumash states, “For the Cloud of G-d would be on the Mishkan by day, and fire would be on it at night, before the eyes of the entire house of Israel throughout their journeys.” Chumash Vaykira is essentially dedicated to the laws of the offerings brought in the Mishkan as well as the laws pertaining to the Kohanim. After the nation merited ‘Divine closeness’, they needed to have a way to maintain that lofty holiness. There had to be a system wherein they could achieve atonement and forgiveness for iniquity and sin. Chumash Vayikra immediately follows Chumash Shemos because it contains the key to maintain what the nation achieved at the conclusion of Chumash Shemos. Rabbi Yitzchok Hutner zt’l made the following observation: If someone were to ask what we are celebrating during the holiday of Shavuos, we would respond that on this day we received the Torah, which is analogous to light. If someone were to ask what we are celebrating during the holiday of Purim, we would respond by quoting the words of the Megillah, “To the Jews there was light,” and the gemara explains that that light refers to Torah. Thus Shavuos is a celebration of Torah which is light, while Purim is the celebration of light which refers to Torah. What is the depth behind that subtle difference? The exodus from Egypt is considered the genesis of our nationhood. Until then we were an enslaved group lost in the morass of exile. But when we emerged triumphantly from the shackles of Egypt en route to receiving the Torah we underwent a drastic metamorphosis and became a nation. The exodus was the preparation for the new covenant which we agreed to at Sinai when we received the Torah. All subsequent redemptions served to preserve that original covenant, which was threatened in each exile. The Zohar relates that the Torah and Klal Yisroel are inextricably bound, reflecting each other in many ways. There are two levels of growth in regards to proficiency in Torah study. One way is to learn new concepts and ideas. The other is to review and strengthen within one’s self ideas which he already learned but were somewhat forgotten over time. The exodus from Egypt reflects the first level of growth, like one being exposed to new concepts and ideas in Torah which he never knew. The salvation in the time of Purim however, is analogous to the second level of growth. Although there may not be any new learning, an in depth review of what one already knew raises him to greater vistas of understanding and appreciation for the concepts he previously learned. During the time of the Purim story Klal Yisroel reaccepted the Torah. It was the same Torah they accepted over a thousand years earlier at Sinai, but at that point they had a deeper and more significant understanding and attachment to the Torah. In this sense the celebration of Purim was not for something new but for something old that was renewed within them. Based on this idea Rabbi Hutner explained that on Shavuos we received the Torah, which is analogous to light. On Purim however, we ‘discovered’ new light; a new light in the Torah we had accepted previously. Therefore, Shavuos is a holiday of Torah which is light, while Purim is a holiday of light which refers to Torah. There is a concept in halacha of “Ayn m’arvin simcha b’simcha - We do not ‘mix’/blend two different sources of joy. When there is cause for celebration our complete focus should be on that celebration. Therefore, we do not celebrate another event at the same time so as not to detract from the original celebration. For example, it is forbidden to get married during one of the major holidays. During the holidays our complete focus must be on the joy endemic joy to that holiday. The joy of a wedding would detract from the joy of the holiday. It is therefore intriguing that the Rema rules that it is permitted to get married on Purim. Why aren’t we afraid that the joy of the wedding will detract from the joy of Purim? The Zev Yitrof explains that the joy of Purim is not specific or exclusive. Rather, the focus of the day is to reach a state of sublime joy and devotion with G-d in any way one can. Purim celebrates the incredible story of the overturning of the decree calling for the annihilation of the Jewish people. Therefore, the holiday of Purim is the celebration of life itself! That joy is all inclusive. Any celebration that brings a person to feel that sublime level of rejoicing is part of the celebration of life itself. Therefore, a wedding would be permitted on Purim. With this in mind we can understand the reason for our increased joy during the month of Adar. During the year our celebrations center around specific blessings in our life, such as our connection with Torah, specific blessing of G-d, a new house, or property, etc. All of those celebrations warrant the recital of the blessing “Shehechiyanu”. During Adar however, we celebrate the fact that we can celebrate. It is analogous to someone involved in a serious accident, who was rushed to the hospital and not given much chance for survival. Yet after months of surgeries, painful therapy, and slow recuperation, he miraculously has a complete recovery. When he walks out of the hospital for the first time everything is exciting. His ability to walk, to hear the birds chirping, to smell the fresh air, and to see people hurrying to their daily affairs, all feels like an incredible gift. It’s a joy of life itself, in every breath he takes. At least during that first day, he appreciates and cherishes everything he always took for granted. The joy of Adar does not warrant the recitation of Shehechiyanu, because the joy of Adar is the blessing itself. It is a month-long celebration that He has, “kept us alive, sustained us, and allowed us to reach this time”. When Adar arrives we have an added awareness of the gift of life and that breeds a resurgent feeling of joy. Our foremost nemesis, the nation of Amalek, attacked us soon after we had left Egypt. At that time we had achieved an almost invincible persona. After all the miracles Klal Yisroel had been privy to during the exodus and afterwards, no nation dared to attack or even threaten us. We were on a spiritually high level and felt extremely close to G-d as we prepared to accept the Torah. Just then Amalek attacked. Despite the fact that they were vanquished their mere attack had a profoundly negative impact. Our cloud of invincibility was gone and we ourselves felt weakened. “Remember what Amalek did to you on the way when you left Egypt. Asher karcha baderech - He cut you off along the way…” The commentaries explain that the word ‘Karcha’ also means cooled. Our war with Amalek is eternal, and we are obligated to never forget what they did, for they cooled our enthusiasm, and quelled our passion. The nation which was so confident and proud suddenly doubted itself and its greatness. Amalek may have been defeated but they had achieved their objective. They had weakened our resolve and confidence. It is the Amalek within ourselves that causes us to lack appreciation for the daily gifts of life. Conversely, it is the fires of inner passion and devotion which destroy the Amalek within ourselves. Purim is not the celebration of something new, but a celebration of a new appreciation of what we always had, but heretofore failed to appreciate. On the highest level this refers to our reacceptance of Torah. But it is also a celebration of the gift of life which we don’t sufficiently ponder or appreciate. It is well-known that it is far easier to diet and lose weight than it is to keep the weight off. It is one thing to receive a tremendous gift or achieve greatness. But the question is if it can be preserved. Shavuos was our receipt and achievement of greatness. But at that point it was unclear whether we could keep it. Amalek sought to ensure that we would indeed be unable to preserve it. But Purim is the celebration of our vanquishing Amalek by maintaining our greatness and appreciating it day in day out. Locke (Natural right to life, liberty, and property, and governments responsibility to protect those rights), Montesquieu (Separation of governmental power into three branches – legislative, executive, and judicial), and Rousseau (Social Contract; people are basically good but become corrupt by society).